In the past, men and boys gathered in the men’s community house for cleansing sweat baths. Naked except for protective mouth masks filled with wood shavings and wearing bird-skin hats to shield their heads, they basked in the fierce dry heat. The hats were whole skins of loons, crows, and other birds, split at the belly. This one is made from a loon. John Phillip, Sr.: Maqissuun. Maqissuun tunutellek. John Phillip, Sr.: No, angukaraurluut taugaam maqissuuteklallruat. Qasgimi pitulit aka, my grandpa. Neva Rivers: Imkuneng eleggluteng pitullrulriit fire-bath. Steam-ayuitellruut tamani. Joan Hamilton: Ii-i [yes], we used to use fire-baths. We didn’t use steam. Museum staff: Why would they have a hat when they were taking a bath? Joan Hamilton: Your head gets hot sometimes. Ilait cal’ maa-i pitulriit [some people do today]. Taugaam ilait-ll’ nacarrayuinateng [some don’t use hats]. Tamalkurmeng piyuitellruut [not all used them]. It’s a personal preference whether you wear a hat or head covering. Neva Rivers: Maqissuutnguluuki makut wii tangyuitelqanka. Atkuuluki tangtullruanka. Atkuuluteng-ll’ elngurluteng. John Phillip, Sr.: Allegngaitut atkuuluteng. Joan Hamilton: These [loon skins] are very durable. They’re really warm. John Phillip, Sr.: That kind [of skin is] good for a parka. You can use it outside to go down a hill of snow, whoosh! Joan Hamilton: We used them for bags for men, when they went out. Neva Rivers: And they put their tools, mellgarateng ekluki. Neva Rivers: Kemgit eggcunaki nerluki taugaam. Virginia Minock: They eat the fat. Joan Hamilton: We used to take it and keligluki uquit [scrape the fat]. They get really fat, and their fat is delicious. Joan Hamilton: Right after mom took the meat out, she just took the skin and [scraped it]. Part of cleaning [the skin]. 2. The traditional mens’ house (qazgi) was the communal residence for all of the adult men in a Yup’ik community. For protection against the intense heat of sweat baths in the men’s house, Yup’ik and Cup’ik men wore hats made from loons, crows, and other birds. 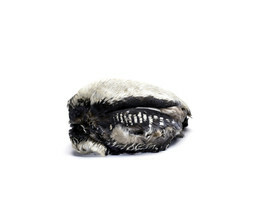 These head coverings were whole bird skins, split at the belly and then dried and softened. (1) Bathers also wore respirator masks filled with wood shavings to protect their lungs. Edward Nelson described sweat bathing customs during his 1877-78 travels in the Yukon-Kuskokwim Delta: “In these buildings [the qasgiq (men’s community house)] sweat baths are taken by men and boys at intervals of a week or ten days during the winter. Every man has a small urine tub near his place, where this liquid is saved for use in bathing. A portion of the floor in the center of the room is made of planks so arranged that it can be taken up, exposing a pit beneath, in which a fire of drift logs is built. When the smoke has passed off and the wood is reduced to a bed of coals, a cover is put over the smoke hole in the roof and the men sit naked about the room until they are in profuse perspiration; they then bathe in the urine, which combines with the oil on the bodies, and thus takes the place of soap, after which they go outside and pour water over their bodies until they become cool…On several occasions I saw them go from the sweat bath to holes in the ice on neighboring streams and, squatting there, pour ice water over their backs and shoulders with a wooden dipper, apparently experiencing the greatest pleasure .